Our next Tara’s Café is coming up. Have a question about Tara’s Triple Excellence (TTE)? Would you like to meet with other TTE practitioners? 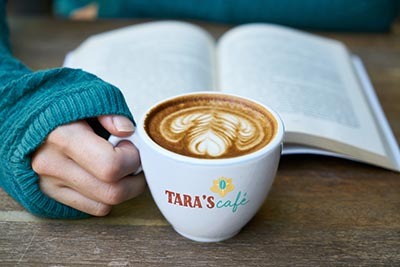 Tara’s Open Café’s are virtual gatherings of Tara’s Triple Excellence practitioners. On the fourth Sunday of every month The Café is a great opportunity to enjoy casual conversation, pose questions or share experience over a cup of coffee or tea, and share the energy of friends who are pursuing a similar spiritual journey. The Tara’s Triple Excellence team helps coordinate the formation of spin-off Petit Cafés that best match the needs of the participants. We can help you create a Café for a local group of participants, an international group, or for a language group. Any kind of practitioners’ group is encouraged. Let us know what would work for you. We are looking forward to being a world-wide group of Cafés that will allow all of us to meet kindred spirits in a friendly, easygoing coffeehouse atmosphere. We will offer two sessions for everyone’s convenience. You may join us on Sunday, April 28th at 8pm CEST (Vienna), or 8pm EDT (New York), using the video-conferencing software called: Zoom.us. You might want to check out the functions of Zoom ahead of time to figure out how to turn your camera on/off and your sound on/off, etc. Here’s a help page with a way to test it out. We will open the Zoom “room” 15 minutes early, so people can get comfortable with all the bells and whistles of their Zoom app. The Zoom link for our session is: https://zoom.us/j/886893203. This will take you to our Zoom conference, and you will enter and be visible to the other attendees. You can email sally@tarastripleexcellence.org with questions about this event.